I have been using these for a couple of years now. 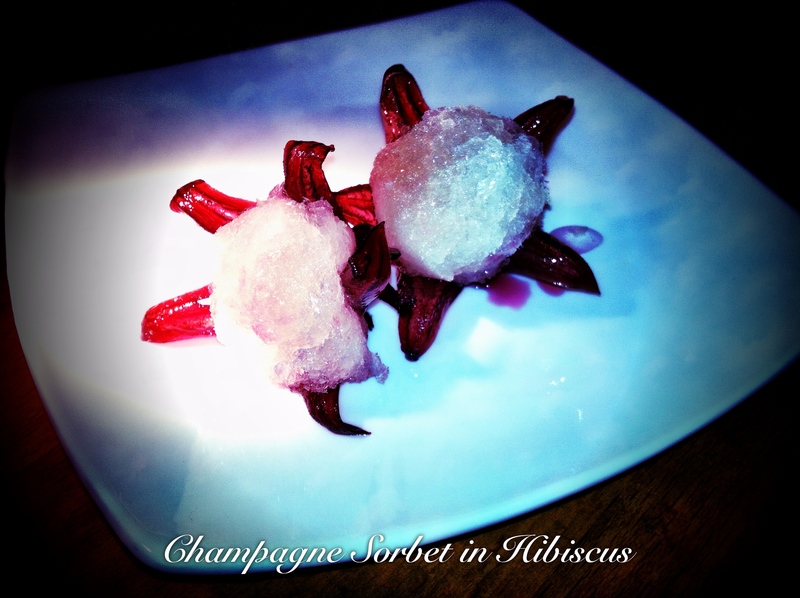 If you have not heard or seen them, hibiscus flowers are a beautiful presentation to the plate. Lately I have been adding it to pan reductions for beef, veal and pork sauces. The sugar balance can enhance a simple vinaigrette. Perhaps reduce the syrup down by 25%, chill it and now you an excellent topping for dessert. Although it is a bit thick to begin with. Fold into whipped cream to add color and flavor, or use it in frozen sorbet or popsicle. Lately it has been getting a bit humid. Why not step up my house lemonade with some of the syrup. Add three or four ice cubes to class. 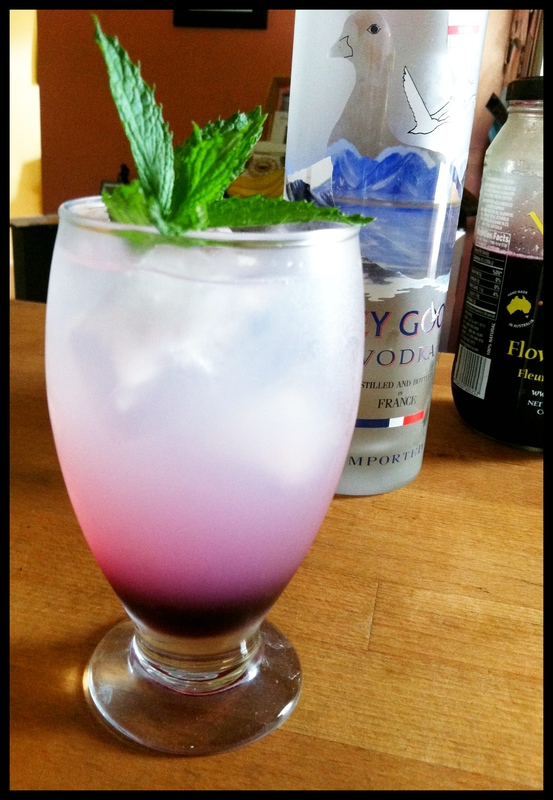 Top with lemonade, vodka and lastly the syrup. Garnish and enjoy! the rind from 1 lemon. 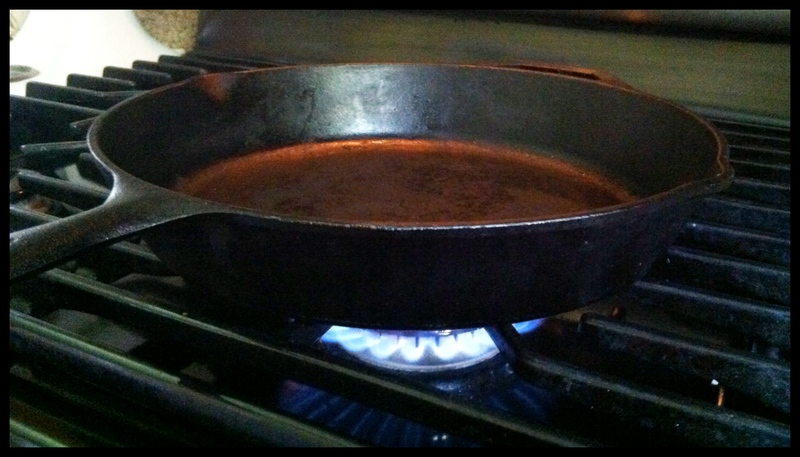 Place agave & 1/2 cup water in a sauce pan and heat to just a boil. Combine into a pitcher all, of the ingredients and chill until use. I had a craving and did not want to stick with standard beef and pork. 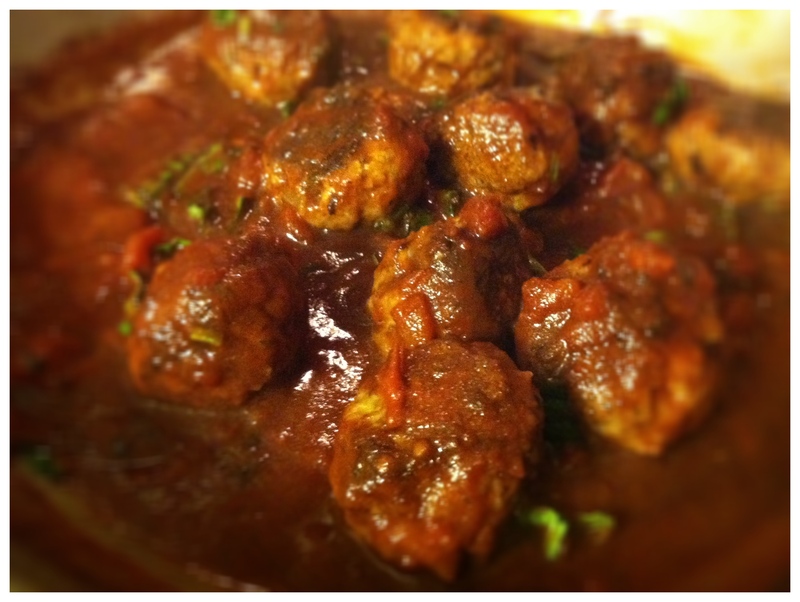 Simple enough and great in a sandwich, veal meatballs freeze well or are an easy prep for an evening meal. Set your oven to 375˚ Convection or 400˚ Bake. Combine all of the meatball ingredients, minus the oil. 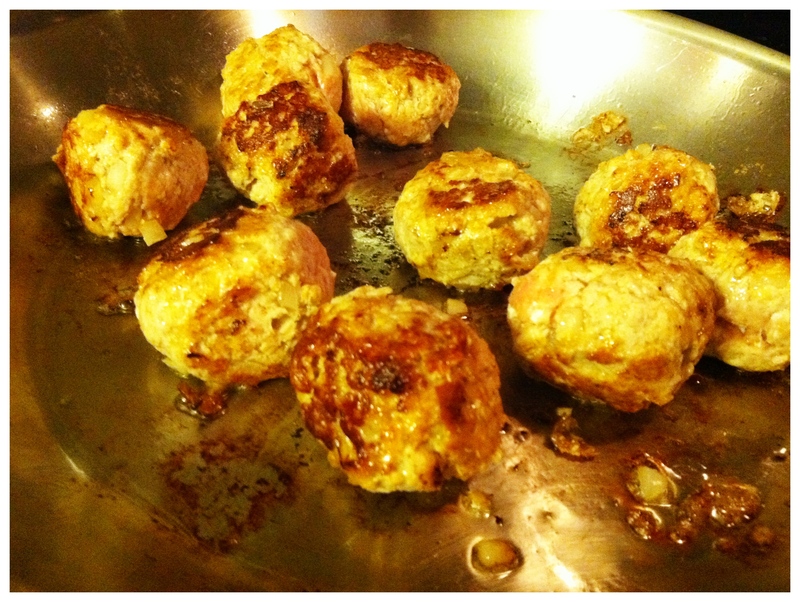 Roll into golf ball size meatballs and place on wax paper lined pan into freezer for 10 minutes. Use a saute or skillet (that can be placed into oven). Heat pan over a medium to high heat. After 1 minute add the 2 tbls high heat olive oil. 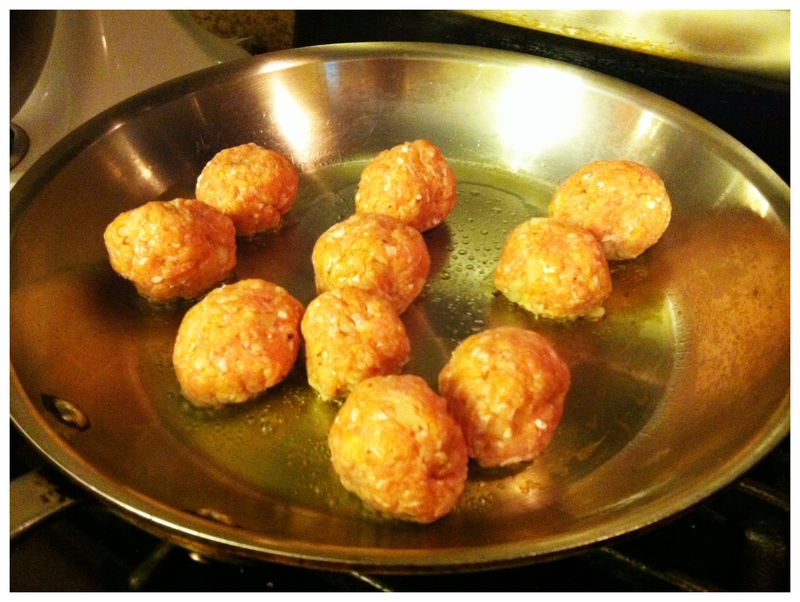 Turn pan to coat and carefully place meat balls into pan. After 2 minutes they begin to turn grey around the base. Use a spatula to turn them as some may stick to bottom of pan. Continue to turn them after a few minutes, then place pan into oven. After 5 minutes, add the garlic & wine to pan. Wait a few minutes then add basil, crushed tomato and paste. Stir and let it continue to cook to reduce (about 8-10 minutes). Remove pan from oven and season with salt and pepper. 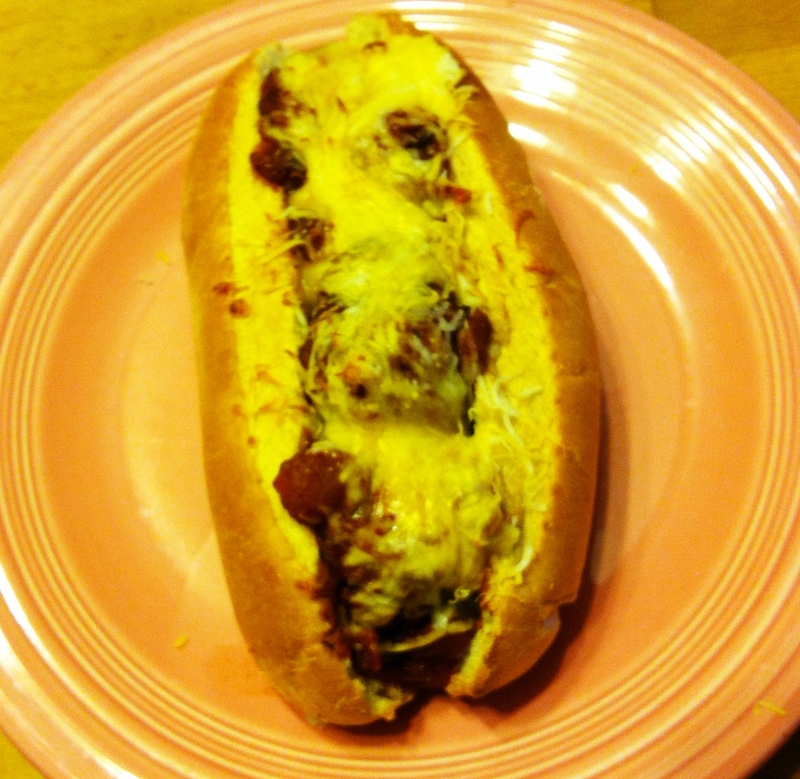 Serve with pasta, rice, as an appetizer or in a bun with some cheese. I couldn’t resist toasting the bun and melting cheese under the broiler. Is Fat a Problem, I thought that Fat was flavor? Recent local legislation, has proposed a law prohibiting school fundraisers from using candy and fresh baked goods to combat fat. How do you respond to this knee jerk response? Everyday a new opt-ed piece comes out about obesity and diabeties. Can stopping kids from baking cupcakes supress obesity levels? “But there is fat in the frosting and the batter,” you say. Okay admittedly I have not researched those in the know who have proposed this and their facts to bring this baking injustice to light. We live a fast, get it done quickly, lifestyle. We don’t have time to sit down and make dinner and spend time with the family. Many drink and eat from fast food establishments, habitually. More than half of processed food contain GMO’s. A few posts ago I described BpA in plastics and in cans that we consume everyday. Simultaneously I reached out to our water service to inquired about Bpa in the water jug. Response: I found out that the current container is Bpa free but they were going to go back to using the containers with Bpa because they are cheaper. OH, YAH! I reached out to a tuna manufacturer about their use of Bpa in a can of food that the food is cooked in. The can is leaching the Bpa into the edible product. Respnse: They said that the FDA safe levels have been approved and so, status quo. DOUBLE YAH! There was a recent story on 60 minutes in which a Doctor told of our addiction to sugar and its health risks, i.e. diabeties. Our Response: Nothing! or better yet, did a Kardashian just do something?…. I think perhaps we should think before we consume anything. But life sometimes takes over and we feel like we don’t have time to. Processed vs. Unprocessed foods: a look into your intestines. I’ll take fresh baked vs manufactured any day of the week. You need a little fat in your food for flavor. Bottom line is if you over indulge in anything, it isn’t good for you. Except, perhaps, baking at home with your kids. 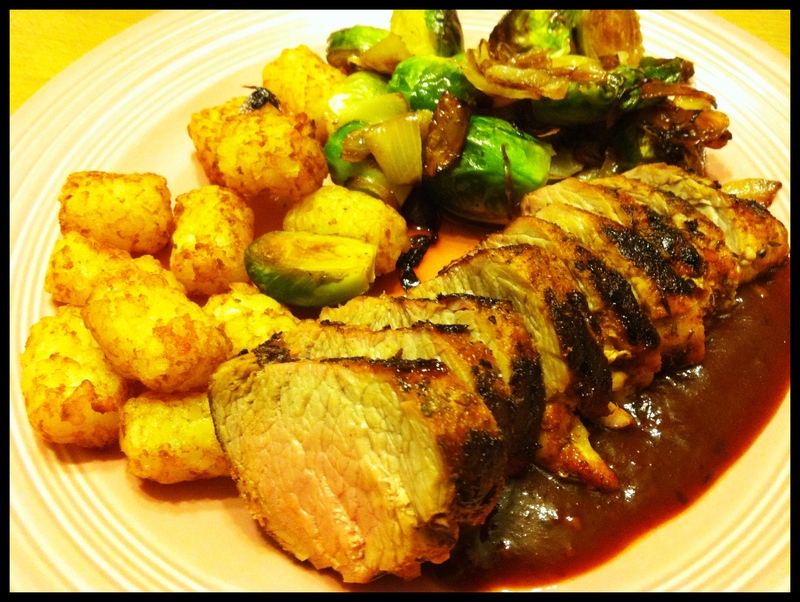 The Dry Rub & Sauce recipes follow the pork tenderloin recipe. 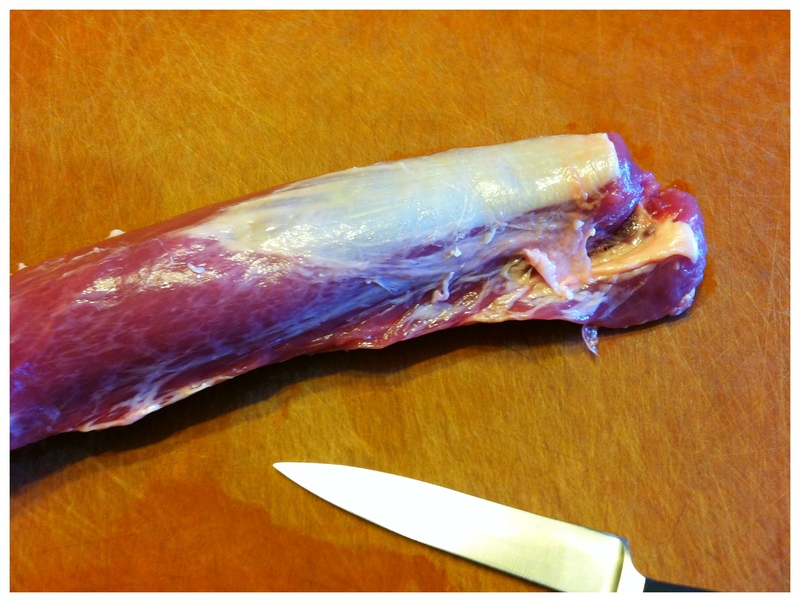 A pork tenderloin needs very little in preparation. Simply pull away any fat that you can by hand. There is a silver skin of fat on the top of the loin. 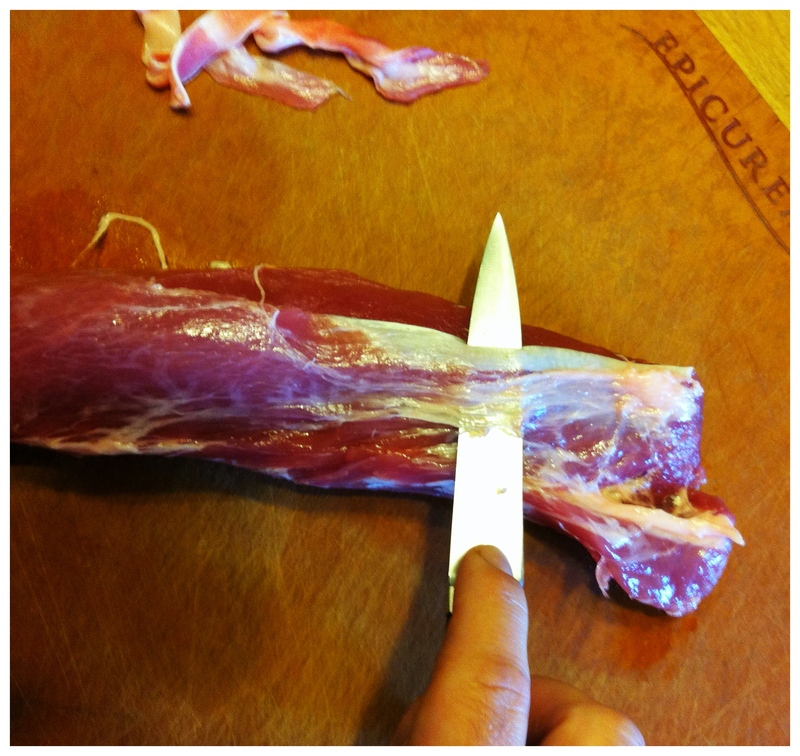 Carefully slide a thin knife, like a paring knife, under this horizontally and just skin it off the tenderloin. This way when you cook it, the meat doesn’t curl up. Also when you bite into it, the meat doesn’t have a stringy piece that you are chewing on. Set your oven on 375˚ convection (or 425˚ Bake). 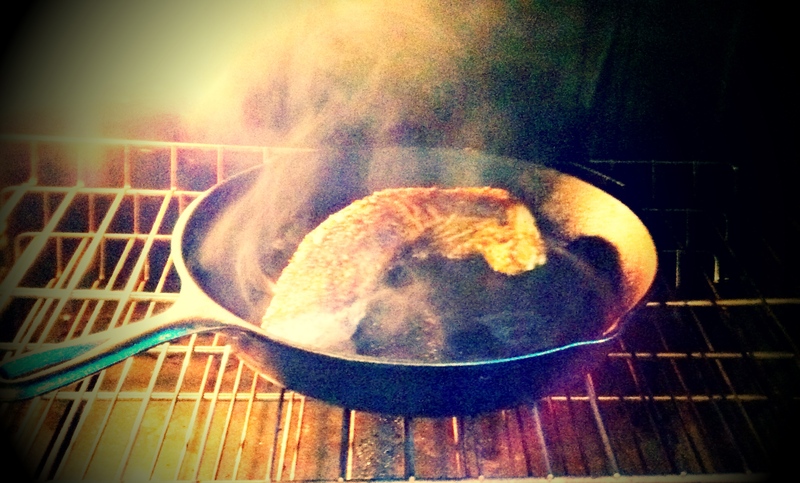 Heat a skillet, preferably cast iron, on a medium to high heat. 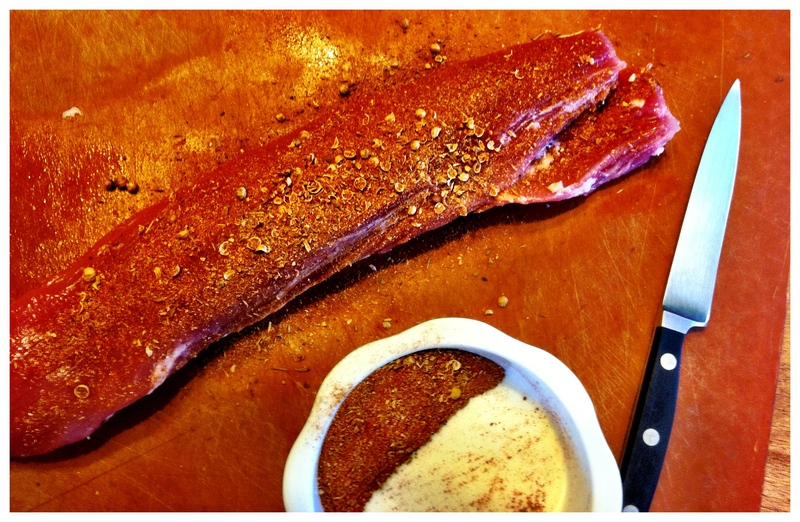 Generously season the tenderloin with the dry rub. 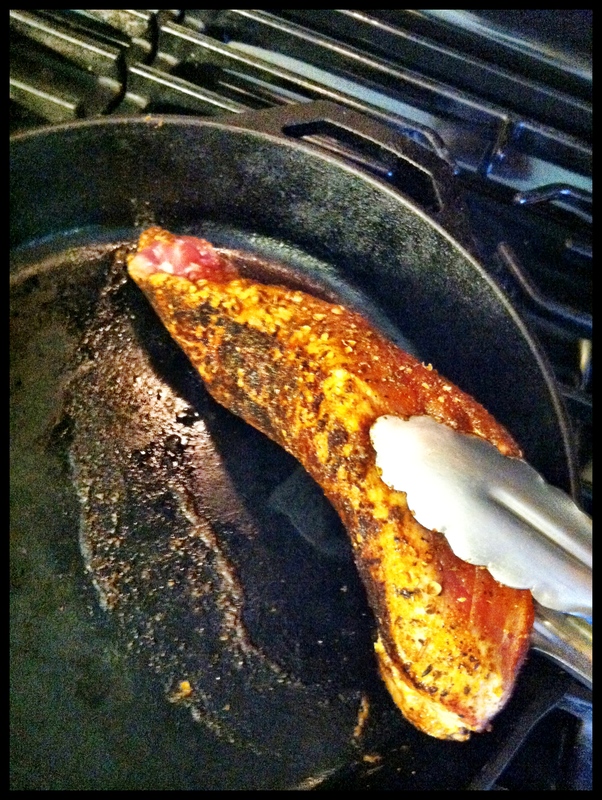 Then oil the pork with either 1 tablespoon melted butter, oil or cooking spray. 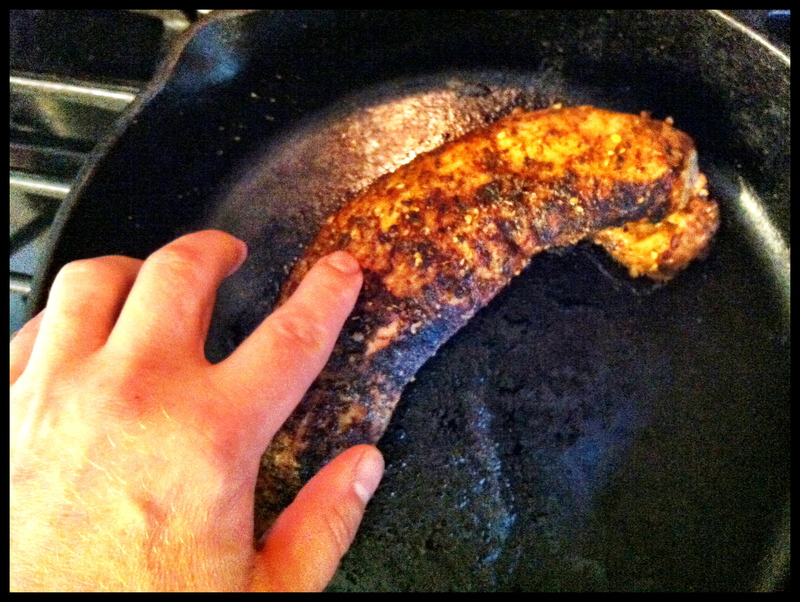 When the sides of the meat are turning gray try to pull it from the pan. If it is still stuck leave it for another 30 seconds. 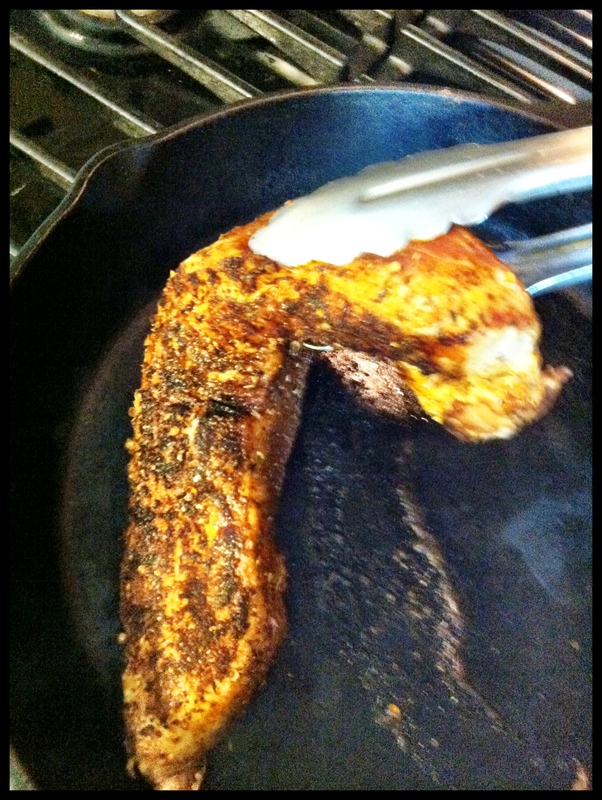 Flip the tenderloin over onto a clean side of the pan and place the pan into the oven. After 12 minutes press down on the thickest part and see if it springs back and any juices that appear are more clear then red. 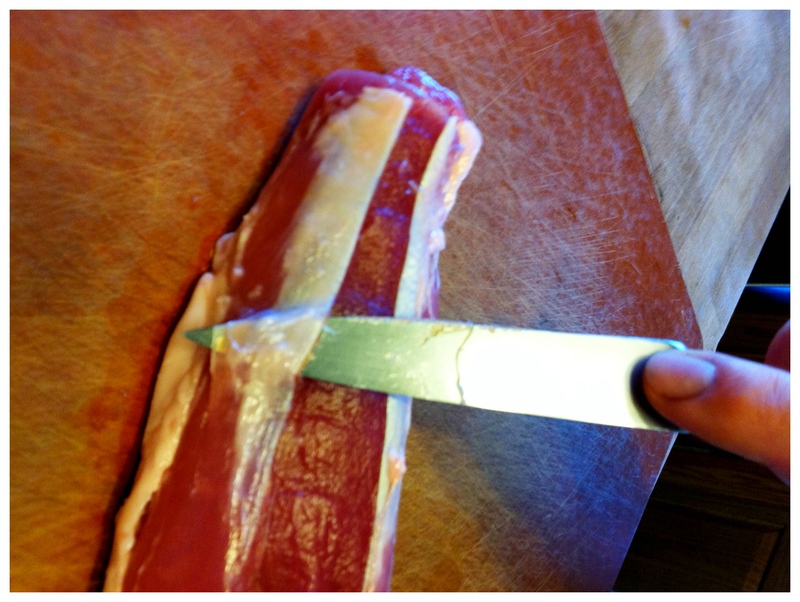 Or if you have a thermometer, check it by going into the thicker part of the tenderloin, horizontally. You should get it to at least 155˚. 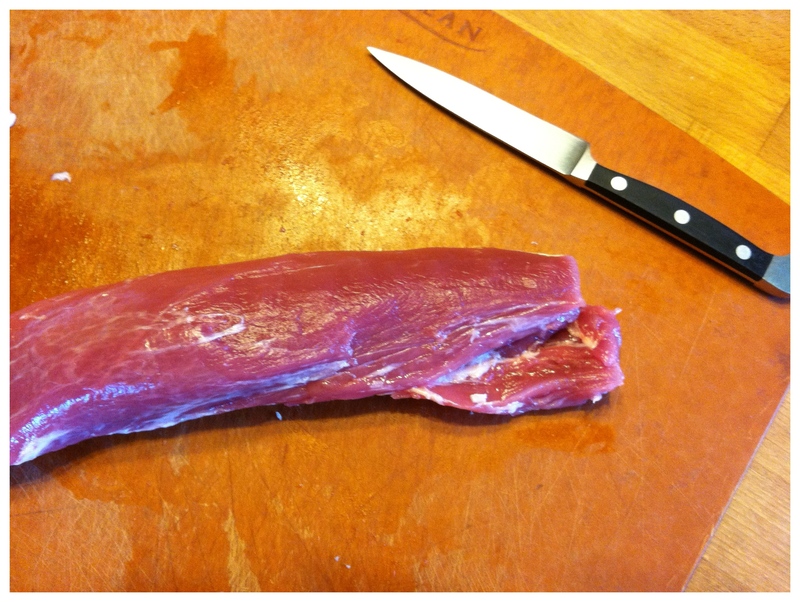 Remove from oven and place the tenderloin on your cutting board uncovered. Let it rest for a few minutes before slicing. During this time it continues to cook up in temperature. As a result, juices will appear onto your board. I toasted the coriander seeds in a pan on the stove top for a few minutes. Then let them cool to the touch and put everything in the coffee grinder and pulsed it a few times. 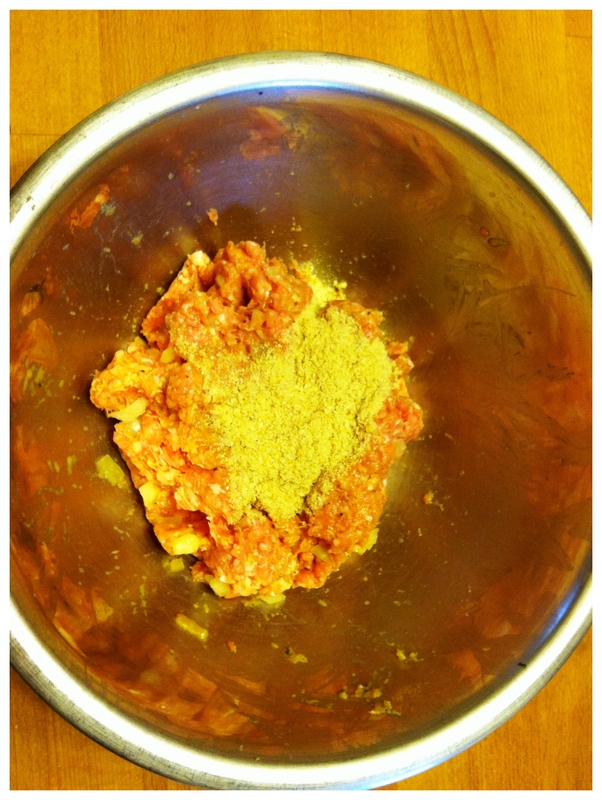 Place all in blender or food processor and pulse then place in sauce pan and heat to cook flavors through. Hold for service. 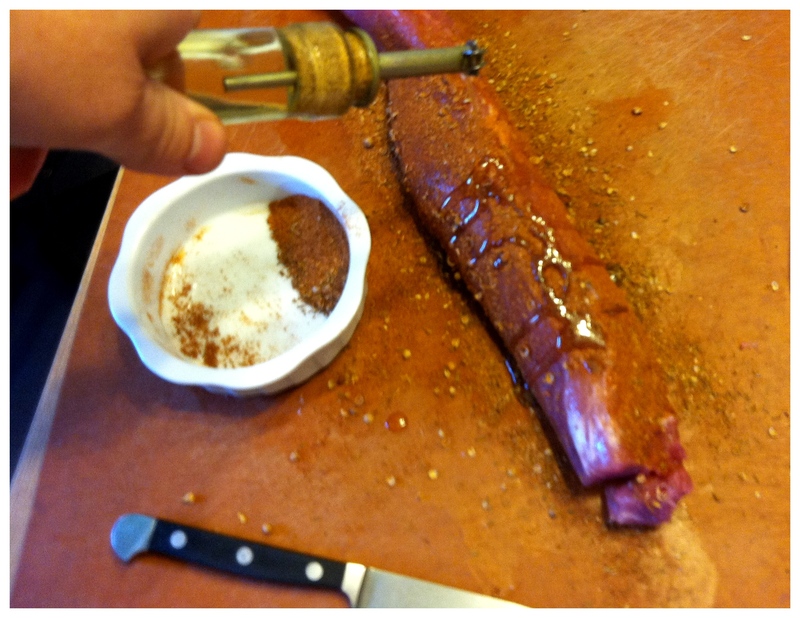 Plate up your tenderloin and glaze with some sauce. Enjoy! I was recently testing out the ILVE professional series range. If you have a rotisserie for your grill or oven or, perhaps you are looking for an oven that has it, here is a quick video demonstration. Previously I posted a recipe for Fall Roasted Vegetables and got an email regarding cooking beets. 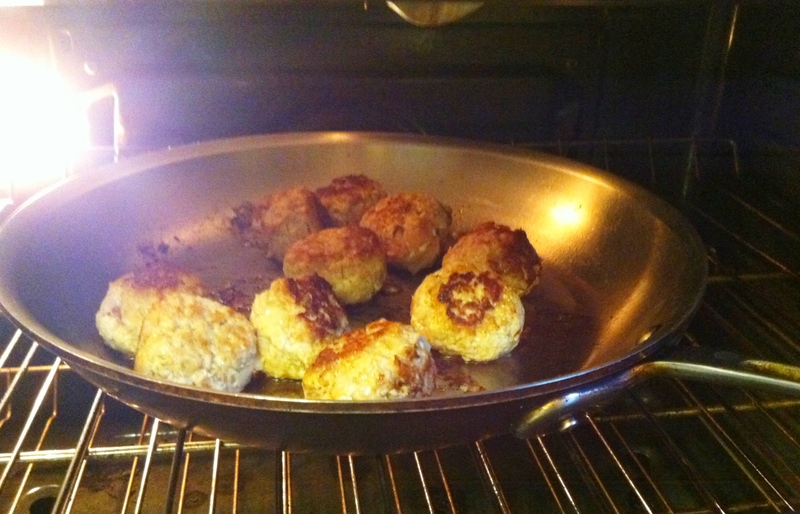 It is a very simple method that can be used in the oven or on a grill with a lid. It works whether they are red, golden, candy striped or heirloom. They do take a while but are worth it. Results are much better than boiling them. This may clarify what I was describing. Check out the video. 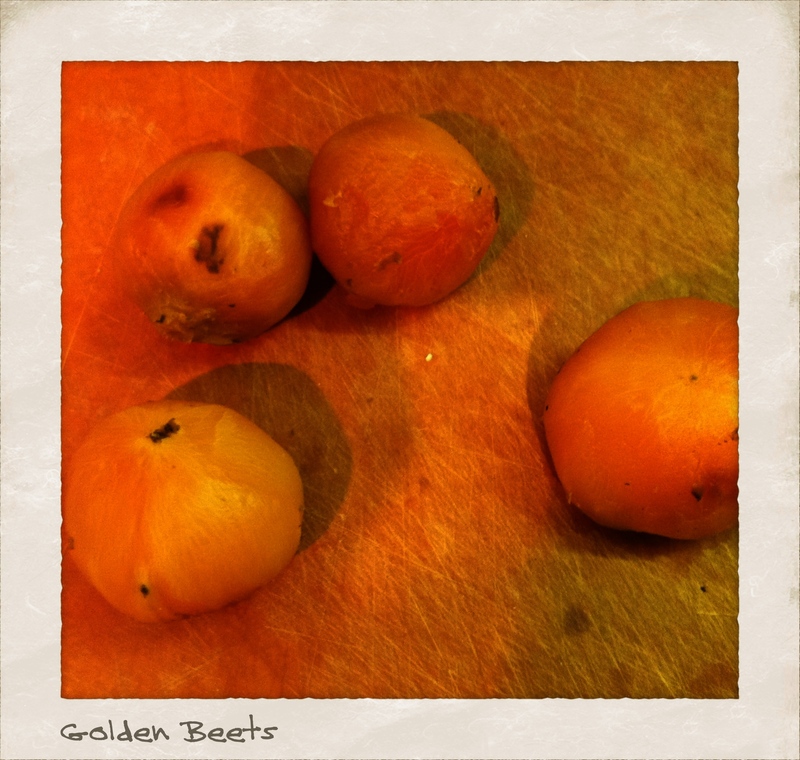 Here are the results for Golden Beets. They are great to use for plate presentations since they don’t bleed as much as red beets. Recently I got inspired by a food truck in Providence RI called MamaKims. Their food is fantastic. Check them out if you are ever in the area. I demonstrated a cast iron pan sear instead of a grill for this. 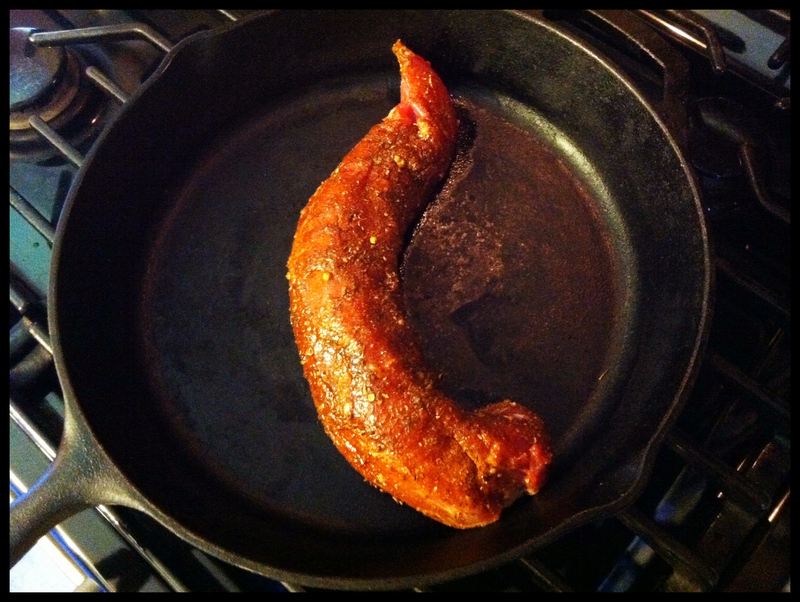 Beginning on a High HEat for a few minutes then turned down to a medium low to cook it to a 145˚ internal temperature. It worked out well, but if you have a gas or charcoal grill, use it. The flavor is even better. This marinated for a couple of hours. I tried a few recipes that only required an hour and it doesn’t do it justice. Do not marinate for days. The extracted juices from the meat get reabsorbed and can make it taste bitter. I made a horseradish aioli which was great, but perhaps try wasabi or a chipotle pepper. Regarding which cut to use, I have seen many recipes with sirloin. This recipe includes that because it is easier to purchase. I used a Hanging Tender because the price was right and the taste is great. If you can get it, use it. 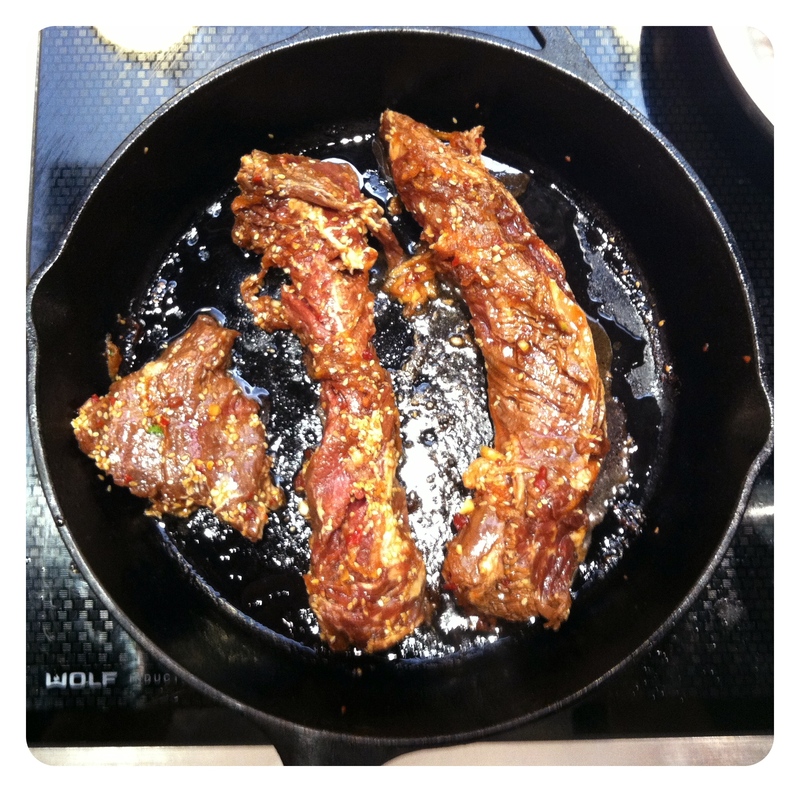 Very versatile and a great cut of meat to marinate. This is listed as a wrap with a flour tortilla because it holds together better than just lettuce or cabbage leaf. Use your culinary imagination and experiment a bit. How about Bok Choi or Radicchio leaves? For the aioli, place first five ingredients in blender or food processor. 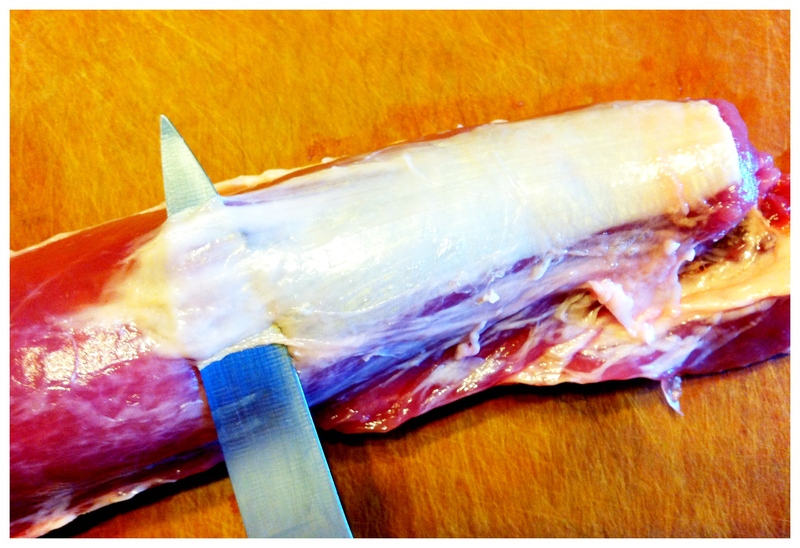 Turn on low and slowly pour in oil to thicken.Use as a condiment to the wrap. Start a hot grill and clean the grates. 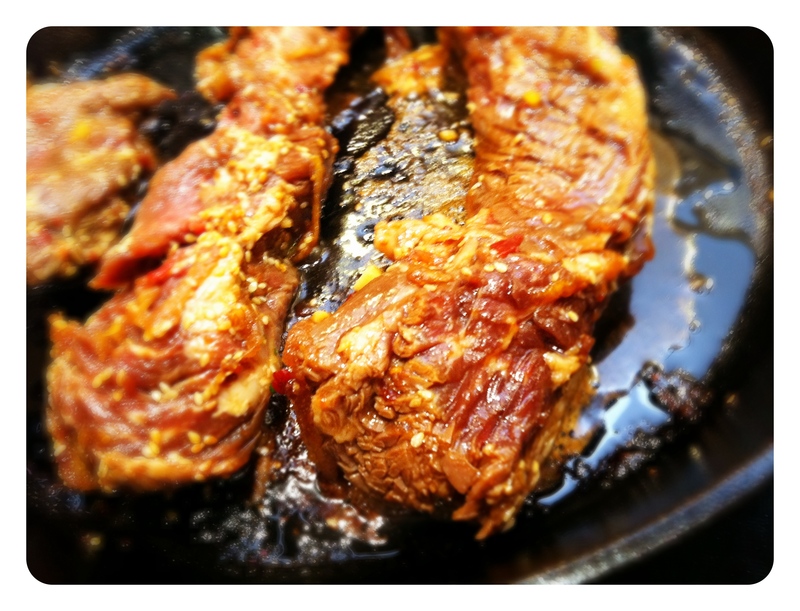 Remove a few pieces of meat at a time and let marinade drip back into bowl. Sear both sides of the steak to dark brown. When all beef is cooked, combine with onion and aioli. 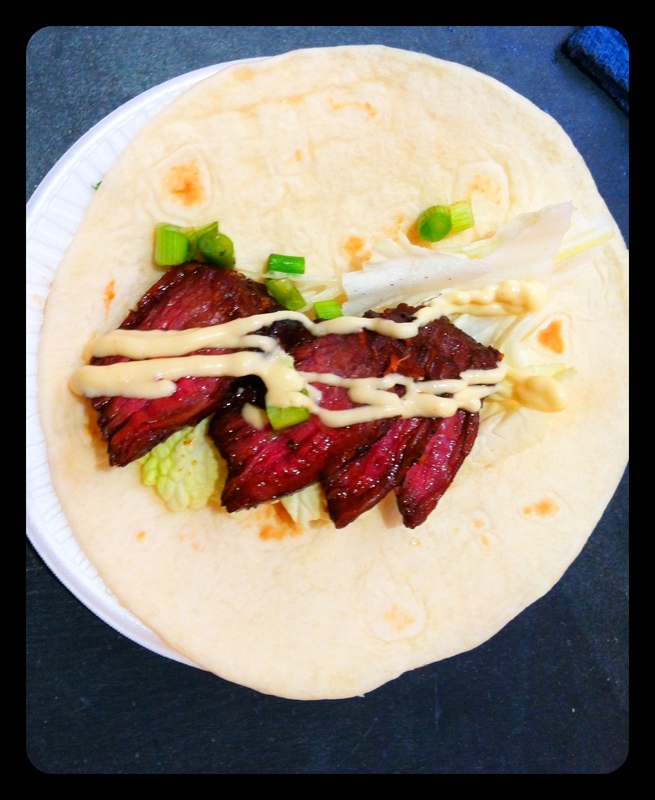 Place a few slices beef and onion in a tortilla lined with a leaf of savoy. *If you don’t want beef, try Boneless Skinless Chicken thighs.